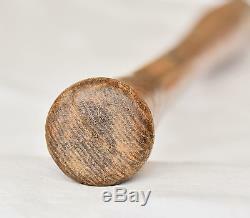 Vintage 1920s Frankie Frisch 40 F. Hillerich and Bradsby Store Baseball Bat. 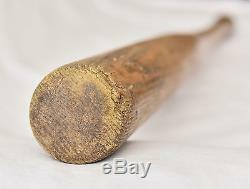 Rare early 192 0s 1930s store bought baseball bat from hall of fame player Frankie Frisch. He played for the New York Giants and the St. The bat weighs 31-32 ounces and measures 34 1/4 inches. Great display piece, has nice patina. The handle is cracked in two places. They were repaired with glue by the player and put back into play. There are signs of tape that once covered the repairs on the handle. The tape was removed, but it left a light area on the handle. There are some glue residue on the repairs. From Wikipedia, the free encyclopedia. Born: September 9, 1898 Bronx, New York. Died: March 12, 1973 (aged 74) Wilmington, Delaware. June 14, 1919, for the New York Giants. August 5, 1937, for the St. 3× NL stolen base leader. Louis Cardinals Hall of Fame. Frank Francis Frisch September 9, 1898. March 12, 1973, nicknamed The Fordham Flash or The Old Flash , was a German American. Of the first half of the twentieth century. He played for the New York Giants. He managed the Cardinals (19331938), Pittsburgh Pirates. He is a member of the National Baseball Hall of Fame and Museum. Louis Cardinals Hall of Fame Museum. New York City, Frisch attended Fordham Preparatory School. He went on to Fordham University. Where he continued to star in four sports: baseball, football, basketball and track. His speed earned him the nickname The Fordham Flash. In 1919, Frisch left Fordham. To sign with the New York Giants. Moving directly to the majors without playing in the minor leagues. He made an immediate impact, finishing third in the NL in stolen bases. In 1920, his first full season. Was so impressed by Frisch that he soon named him team captain, giving him advice in baserunning and hitting. The Giants played Frisch at both third base. Early in his career, but by 1923 he was installed as the team's full-time second baseman. 300 in his last six seasons with New York. He was also an expert fielder and a skilled baserunner. In 1921, he led the National League with 48 steals, in 1923 in hits. And in 1924 in runs. With Frisch adding his fiery competitiveness to the team, the Giants won the World Series. In 1921 and 1922, winning the NL pennant the following two seasons as well. Frisch is tied with Pablo Sandoval. For the franchise post-season multi-hit games record of 15. After the 1926 season, Frisch was traded with pitcher Jimmy Ring. After an August 1926 loss in which Frisch had missed a sign, costing the Giants a run, McGraw had loudly berated Frisch in front of the team; Frisch responded by leaving the team, and his previously close relationship with McGraw virtually ended. Playing second base for the Cardinals, Frisch appeared in four more World Series (1928, 193031, 1934), bringing his career total to eight. He was the driving force of the Gashouse Gang. , the nickname for the Cardinals clubs of the early 1930s, which were built around him to reflect his no-holds-barred approach. The Cardinals had won only one pennant before Frisch joined the team; the Giants would win the pennant only once in Frisch's nine seasons as the Cards' regular second baseman. Frisch played eleven seasons with the Cardinals. In 1931, he was voted the Most Valuable Player. In the National League after batting. 311 with 4 home runs. 82 RBI and leading the League in stolen bases. The 1931 Cardinals also triumphed in the World Series, defeating Connie Mack. S defending two-time champion Philadelphia Athletics. Frisch became player-manager of the Cardinals in 1933, and was named to the NL's first three All-Star. In 1934, he managed the Cardinals to another seven-game World Series victory this time over the Detroit Tigers. Frisch finished his playing career in 1937. His career statistics totaled a. 316 batting average, still the highest ever for a switch hitter, with 2880 hits, 1532 runs, 105 home runs and 1244 RBI. He also stole 419 bases in his nineteen playing seasons. His hit total stood as the record for switch-hitters until Pete Rose. 300 for his career from each side of the plate; the only other switch-hitter with more than 5,000 at-bats with this distinction is Chipper Jones. Frankie Frisch was elected to the Baseball Hall of Fame. After no players had been selected by the writers in the previous two years (the only elections since 1942), the rules were revised to limit eligibility to those players who had retired after 1921; Frisch was among the first four players to benefit from the more reasonable field of candidates. After his retirement as an active player, Frisch continued to manage the Cardinals, but was never able to capture another pennant. Frisch also had managerial stints with the Pittsburgh Pirates. (194046) and the Chicago Cubs. (194951), but without the success he had in St. Frisch's career ledger as a manager shows a 1,1381,078.514 mark, including the pennant in 1934. He also spent the first two months of the 1949. Season as a New York Giants' coach, working under his old double-play partner, Leo Durocher. Before leaving June 14 to replace Charlie Grimm. As manager of the Cubs. Frisch also worked for several years as a baseball color commentator. In 1939, he called games for the Boston Bees. And the Boston Red Sox. A regional radio network serving five New England states. He also called Giants radio in 1947-48, then worked as a post-game host for the team's telecasts in the 1950s. After a heart attack in September 1956 forced Frisch to curtail his activities, Phil Rizzuto. As a player filled in for him on Giants post-game shows for the rest of the season. From 1959-61, Frisch teamed with Jack Whitaker. To form the backup crew for Saturday Game of the Week. A number of years after Frisch left the playing field as a manager, he became a member of the Hall of Fame's Committee on Baseball Veterans. Which is responsible for electing players to the Hall of Fame who had not been elected during their initial period of eligibility by the Baseball Writers. He later became chairman of the committee. In the years just prior to his death, a number of Frisch's Giants and Cardinals teammates were elected to the Hall; some notable writers, chiefly among them Bill James. Have criticized these selections including Jesse Haines. Which include some of the most widely questioned honorees in the Hall's history. Critics have complained that many of these selectees had accomplishments which were less outstanding than those of other players who were bypassed, and were only selected because of Frisch's influence. The grave of Frankie Frisch. Frisch died in Wilmington, Delaware. From injuries suffered from a car accident near Elkton, Maryland. He was 74 years old. Frisch had been returning to Rhode Island from the meeting of the Veterans' Committee in Florida. When he lost control of his car. Frisch died in the same manner as other N.
Giant Hall of Famers Mel Ott. He is interred at Woodlawn Cemetery. During his lifetime, Frisch used 1898 as his year of birth, although other records (Social Security death index, Census records, World War I Draft registration, and passport application) indicate an 1897 birth. In 1999, he ranked number 88 on the The Sporting News. List of the 100 Greatest Baseball Players. And was a nominee for the Major League Baseball. In January, 2014, the Cardinals announced Frisch among 22 former players and personnel to be inducted into the St. For the inaugural class of 2014. Frisch is mentioned in the poem Line-Up for Yesterday. And Frankie and Frisch; I wish he were back With the Giants. Years later, Nash added a footnote to this stanza: p. For many years, he lived at 184 Fenimore Road in the Bonnie Crest neighborhood of New Rochelle, New York. He had two hounds named Flash and Patches who kept him company. Frisch eventually moved to Charlestown, Rhode Island. Devoting himself mainly to his interests in gardening and classical music. 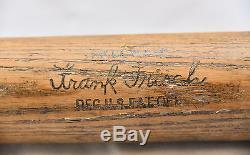 The item "Vintage 1920s Frankie Frisch 40 F. Hillerich & Bradsby Store Baseball Bat" is in sale since Saturday, January 14, 2017. This item is in the category "Sports Mem, Cards & Fan Shop\Vintage Sports Memorabilia\Bats". The seller is "sports_memorabilia_collectibles" and is located in New York, New York. This item can be shipped worldwide. Team: New York Giants, St.